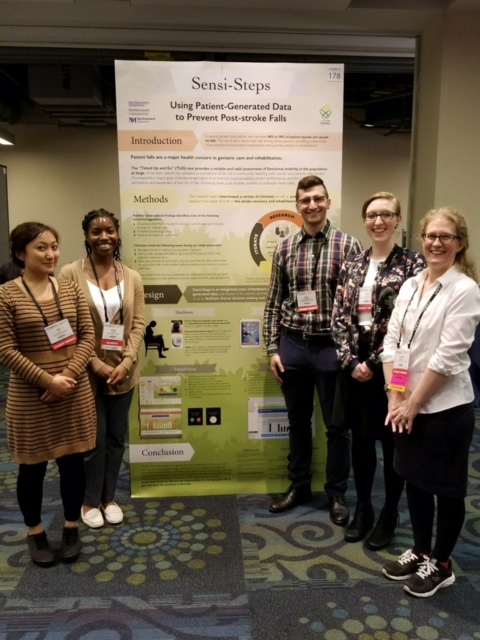 An interdisciplinary team of graduate students from Northwestern and Oregon Health & Science University (OHSU) took second place in the Student Design Challenge hosted by the American Medical Informatics Association (AMIA) in November 2017. Two members of the team – Ada Ng and Eleanor Burgess – are PhD fellows in the Design Cluster, an interdisciplinary doctoral cluster program sponsored by the Segal Design Institute, the McCormick School of Engineering, and The Graduate School at Northwestern. The team also included Noah Weingarten from the Feinberg School of Medicine, Angela Smith from the Technology and Social Behavior PhD program, and Jennifer Pacheco from OHSU. For its Student Design Challenge, the AMIA invited graduate students from around the country to propose novel solutions focused on leveraging Patient Generated Data (PGD) to improve patient care. PGD has drawn attention from the healthcare industry because it has the potential to provide new insights into patients' lives and health outside of traditional clinical encounters. The Northwestern team included students with backgrounds in medicine, informatics, communications, and computer science. To begin the design process, the team met with a neurologist at the Shirley Ryan AbilityLab to learn about the recovery process for people who have suffered a stroke. Next, the team assessed the current technologies available to patients and reviewed the existing literature about their unique needs. The team also conducted qualitative needs assessment interviews with primary care doctors, neurologists, physical and speech therapists, caregivers, and people at risk of stroke. These initial findings shaped the team’s creation of a tool called Sensi-Steps that would allow patients to take regular fall-risk assessments in the safety of their own home and then share that information with their healthcare provider. Burgess explained what she learned from engaging in a design process with multiple stakeholders for the AMIA Student Design Challenge. "Designing within the complex constraints and procedures of the healthcare system is challenging, but now I see that one way to tackle this complexity is to interview and contextualize the many potential stakeholders of a project," said Burgess. "Interviewing a diversity of people begins to show challenges at a systems level, enabling us as designers to shape our work to take into account the interrelated changes that will occur when a new technology is integrated into people's daily work practices and workflows." The team from Northwestern and OHSU was chosen as one of eight finalists for the AMIA Student Design Challenge based on their submission and invited to attend the AMIA Annual Symposium in Washington, D.C. in November. There, the finalists presented in a poster session. The top three finalists, including Northwestern and OHSU's team, gave an additional formal presentation of their solution and were awarded second place by a panel of judges. Ng pointed to the interdisciplinary nature of the team as the key to their success in the competition. "Our team consisted of students from communications, computer science, informatics, and medicine. What was critical was that we all came in with the understanding that no one person was an expert across all the domain areas that were necessary to compete in this challenge, but together we could add up to a powerful whole," said Ng. "We all had to learn about each other's strengths and know when to lean on them and I believe that’s what led us to success." Justin Starren, head of the Division of Health and Biomedical Informatics at the Feinberg School of Medicine, praised the team’s effort. "The presentation from this team balanced both the technical considerations as well as clinical needs," Starren said. "I predict this success will encourage more of our students to participate in this competition in coming years. This team has set a high bar for future teams to follow."